Cocktail fans and home entertainers seeking fresh drink flavors will love this buzz-worthy gift set. Cocktails, mocktails, tea, and lemonade are nectar of the gods when sugar is swapped out in favor of the complex, delicate flavor of honey. Cocktail lovers and home entertainers who love trying delicious new twists on their tried-and-true recipes will happily add this gift set to their hive. Made with just five natural ingredients, Greta McCoy's organic, honey-based simple syrup is a delicious, healthier alternative to regular simple syrup, and just as easy to use. It's fun to watch tasty cocktail ingredients swirl around in the leak-proof, copper-topped mason jar shaker. 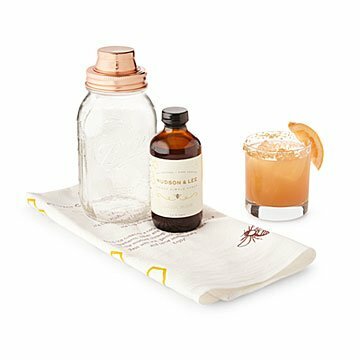 The super-absorbent, 100% cotton flour sack towel complements the vintage-inspired shaker and two bee- and beehive printed cocktail recipe cards. It's the bee's knees. Made in Louisburg, North Carolina. North Carolina mother of two and self-described “hippie at heart,” Greta McCoy is on a quest to create simpler, more natural food products. She loves bees and the honey they make, and has always made her own natural honey syrup. One day, she wondered, "Why can’t this be bottled and available for everyone to purchase and use?" After lots of hard work, she perfected her syrup and drink recipes to share. She hopes you’ll love them as much as her family does.